Britain is a country blessed with a wealth of history; from ancient Celtic barrows, through to Roman villas and imposing medieval fortresses, and on to the architectural splendour of the Victorian era. From Stonehenge to St Albans Abbey, from Windsor Castle to Westminster, our ancestors have left us all with a precious legacy; a huge array of buildings – many of them open to the public – which serve as a timeless testimony to our extensive heritage. When walking around such places, places which have survived and persisted through generation after generation of Britons, it is easy to feel that these solid rock-hewn castles and towering cathedrals are impregnable; that they will simply always be there as a constant national bequest for future generations to inherit. But history does not stand still, and our ancient fortresses – built to withstand the enemies of their day – are not always proof against the inevitable march of progress. The occupying Romans desecrated centuries-old Druidic temples, Cromwell destroyed castles across the land upon gaining power and Henry VIII obliterated a wealth of ancient abbeys and monasteries. Of course, such destruction has always been cyclical, part of our historical evolution, and for every desecrated temple we have, in the fullness of time, gained a Roman villa. For every devastated castle a magnificent country manor has been constructed. History, and the buildings which remain as its legacy, is always developing, always evolving. However, in more modern times – from the industrialisation of the Victorian era through to the consumerism of the late twentieth and early twenty-first centuries – a new type of evolution has developed: one which uses up our heritage as a resource, without necessarily replacing it. As the United Kingdom gained in prosperity at the turn of the Nineteenth century, two key social and political developments occurred. Firstly the country moved from a hierarchical structure, based upon a wide divide between the ruling classes and the masses, to become a capitalist system, based upon the forces of trade and economics. Economy became the key – and this can be seen in the legacy of buildings that this era has produced: minimalist structures, often temporary and built of cheap, mass-produced materials, unlikely to survive down the centuries for future generations to marvel at. The second development, a result of increased economic prosperity and stability, was the blurring of the divide between the haves and the have-nots, and the rise of the affluent middle-classes. This, along with the booms in immigration both after the Second World War and with the opening up of Europe at the end of the Twentieth century, led to an explosion in the demand for affordable housing and – as a result – land became a valuable commodity. This shift of focus to the needs of the populace, coupled with the need for more and more land to build on, is perhaps a greater threat to face our legacy of historical buildings than the gunpowder and cannons of old. Throughout the last century, despite the work of bodies such as English Heritage and the National Trust in preserving much of our heritage for the public, many beautiful and unique buildings and their lands have been sold off. These valuable national heirlooms have been divided up, demolished and obliterated, to be replaced with uniform, utilitarian housing estates and commercial industrial sites. Unlike the Romans, the Elizabethans and the Victorians, our modern architects rarely seek to continue the cycle of history. Their concern is to build extensively, efficiently and cheaply – as the vast, faceless, prefabricated silos of our modern commercial parks testify. Where we do seek to be innovative in our buildings, often there is an element of form over content, and a sense of building for the moment rather than for the future. Sir Norman Foster’s impressive glass structures for example, whilst visually stunning and highly innovative, are unlikely to remain intact for centuries to come. Given this fact, and given that the demand for land for new housing is continuing to grow, it is perhaps a small comfort that we do at least have the means to capture a sense of what we are losing and have already lost. With the advent of photography, of film and more recently the Internet, we have the means to preserve the images of the constructions that have vanished forever, to document for future generations the legacy of our ancestors which we have sold off in the name of progress. 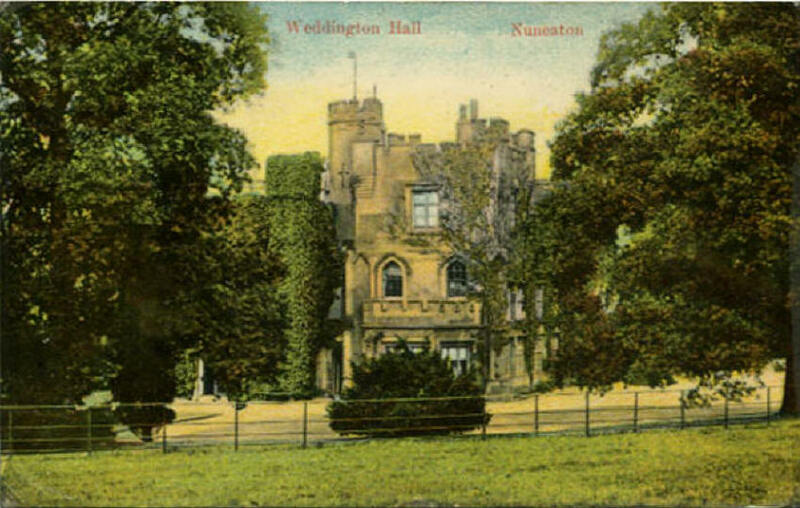 This account seeks to preserve what remains of one of those lost heirlooms, a place variously known as Weddington Hall or Weddington Castle. 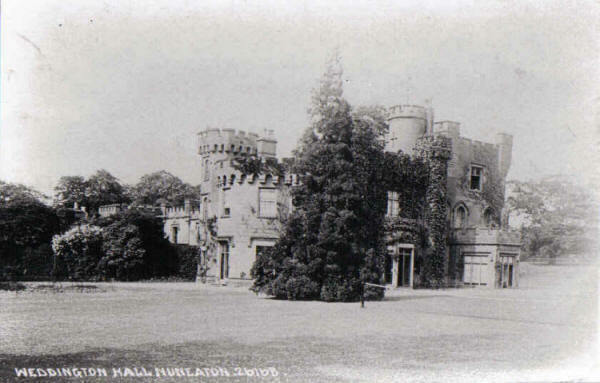 Evolving from a Royal Hunting Lodge in the ancient village of Weddington to become an extensive fortified Hall set amidst beautifully landscaped gardens, this centuries-old building was demolished in the 1920s to make way for a housing estate. This website cannot serve, therefore, as a guide to your knowledge as you walk through the wooden floored library of the Hall, or ascend the imposing staircase of fine old oak that once greeted visitors, or wander around the picturesque boating lake that graced the Hall’s grounds. It does, however, seek to bring together what remains of this once-splendid building. Of course, such remains - a handful of black and white photographs, the occasional record in local journals - can never replace the actual physical presence of this lost building; cannot evoke the atmosphere and sense of continuity that one feels when walking on ancient flagstones where kings and queens walked centuries before. But they can at least serve as a reminder that for all our wealth of history that has survived down the years, there is a sub-strata of history that did not survive. The suburban estates and grey industrial units of today are built upon the solid foundations and extravagant gardens of once-great manors that now only exist – ghostlike – in faded photographs and historical archives.